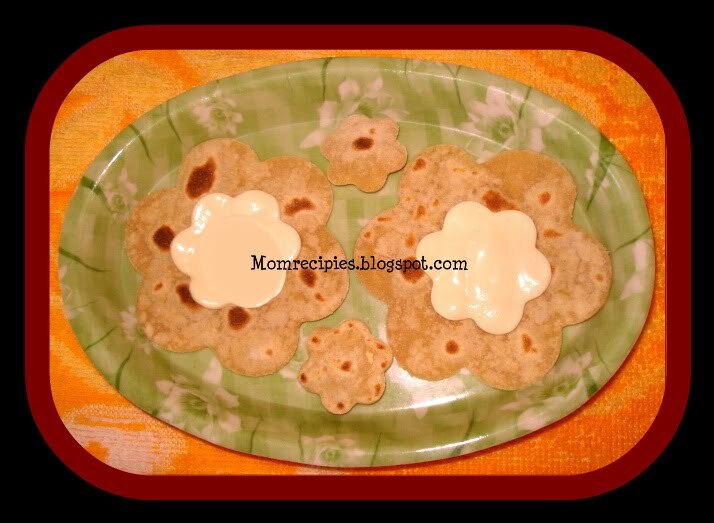 These quesadillas are open faced and are made into super-cute shapes by using a large cookie cutter for the tortilla and a smaller one in the same shape for the cheese.Kids will love and enjoy this .They will eat without any fuss. 1) Use a large cookie cutter ,cut out shapes from the tortilla as desired.Using a small cookie cutter,cut the cheese slices into equal number of shapes. 2) Heat a frying pan on medium heat. Spray with Olive oil and add tortilla cutouts. 3) Cook the first side until it is golden for 1-2 minutes.Flip the tortilla and top each with a cheese cutout. Cover the pan and cook on second side until the cheese is melted for 1-2 minutes. 4) Transfer the quesadillas to a serving plate and let it cool slightly. 5) Garnish with salsa if using or sour cream or guacamole and serve. Quesadillas are so versatile you can literally put anything you like. ...and the list goes on, only limited by your imagination.